The elbow is the joint connecting the upper arm to the forearm. It is classed as a hinge-type synovial joint. In this article, we shall look at the anatomy of the elbow joint; its articulating surfaces, movements, stability, and the clinical relevance. Note: The proximal radioulnar joint is found within same joint capsule of the elbow, but most resources consider it as a separate articulation. Like all synovial joints, the elbow joint has a capsule enclosing the joint. This in itself is strong and fibrous, strengthening the joint. The joint capsule is thickened medially and laterally to form collateral ligaments, which stabilise the flexing and extending motion of the arm. Intratendinous – located within the tendon of the triceps brachii. Subtendinous – between the olecranon and the tendon of the triceps brachii, reducing friction between the two structures during extension and flexion of the arm. Subcutaneous (olecranon) bursa – between the olecranon and the overlying connective tissue (implicated in olecranon bursitis). 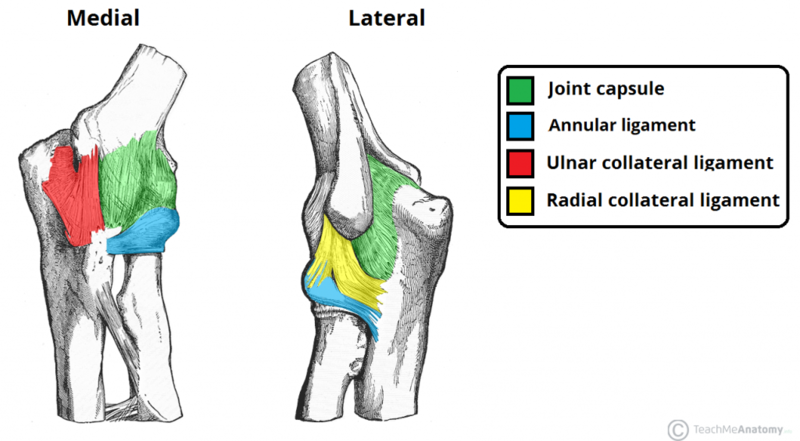 The radial collateral ligament is found on the lateral side of the joint, extending from the lateral epicondyle, and blending with the annular ligament of the radius (a ligament from the proximal radioulnar joint). The ulnar collateral ligament originates from the medial epicondyle, and attaches to the coronoid process and olecranon of the ulna. Fig 2 – Ligaments of the elbow joint. The arterial supply to the elbow joint is from the cubital anastomosis, which includes recurrent and collateral branches from the brachial and deep brachial arteries. Its nerve supply is provided by the median, musculocutaneous and radial nerves anteriorly, and the ulnar nerve posteriorly. Note – pronation and supination do not occur at the elbow – they are produced at the nearby radioulnar joints. Subtendinous bursitis: This is caused by repeated flexion and extension of the forearm, commonly seen in assembly line workers. Usually flexion is more painful as more pressure is put on the bursa. 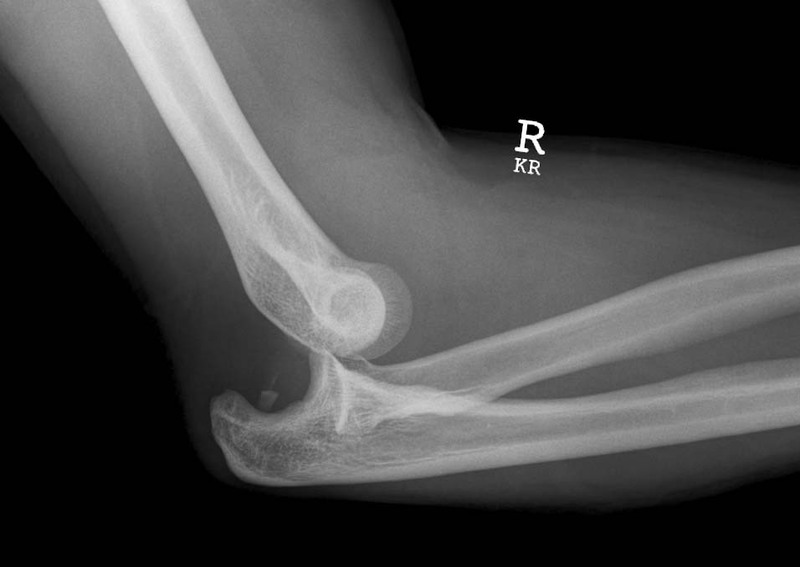 Fig 3 – X-ray of a posterior dislocation of the elbow. Most elbow dislocations are posterior, and it is important to note that elbow dislocations are named by the position of the ulna and radius, not the humerus. Most of the flexor and extensor muscles in the forearm have a common tendinous origin. The flexor muscles originate from the medial epicondyle, and the extensor muscles from the lateral. Sportspersons can develop an overuse strain of the common tendon – which results in pain and inflammation around the area of the affected epicondyle. Typically, tennis players experience pain in the lateral epicondyle from the common extensor origin. Golfers experience pain in the medial epicondyle from the common flexor origin. This is easily remembered as golfers aim for the ‘middle’ of the fairway, while tennis players aim for the ‘lateral’ line of the court! A supracondylar fracture usually occurs due to a fall onto on outstretched, extended hand in a child (95%) but more rarely can occur by a direct impact onto a flexed elbow. It is typically a transverse fracture, spanning between the two epicondyles in the relatively weak epicondylar region formed by the olecranon fossa and coronoid fossa which lie opposite each other in the distal humerus. Direct damage, or swelling can cause the interference to the blood supply of the forearm via the brachial artery. The resulting ischaemia can cause Volkmann’s ischaemic contracture – uncontrolled flexion of the hand, as flexors muscles become fibrotic and short. There also can be damage to the medial, ulnar or radial nerves. As a result, the neurovascular examination and documentation of all patients presenting with these injuries is vital. Sometimes, the blood supply can be interrupted acutely leading to a ‘pale, pulseless’ limb often in a child, usually requiring emergency surgery. 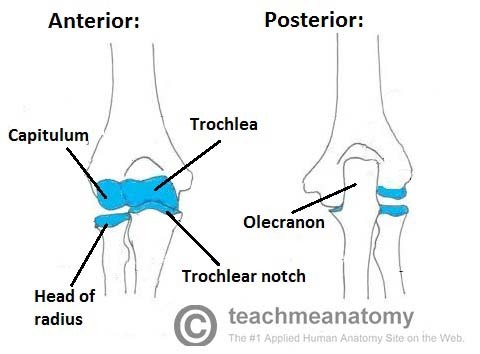 Which of the following does NOT contribute to the articulatory surface of the elbow joint? ‘Tennis elbow’ refers to inflammation of which structure? What nerve is NOT at risk of damage in a supraepicondylar fracture?